......The embroidery work is now complete. 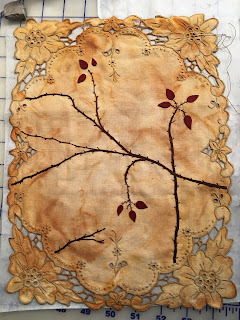 Red berry motifs are being auditioned. Fortunately, my stash includes two bins of ultra-suede scraps which translate well for small motifs where texture is beneficial. 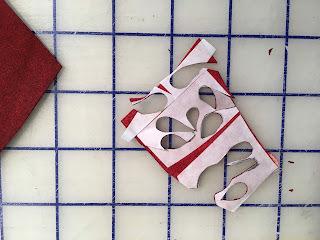 I like to trace the design onto freezer paper, press it to ultra-suede and cut out using a very sharp small scissors. 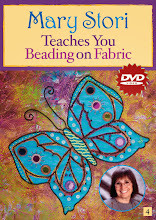 If necessary, a dab of glue can be used to hold the item in place as it's hand appliquéd in position. Once the accent motifs were in place, as much of the stabilizer as possible was trimmed away. Next, as you can see by the needle and thread, I began the tedious task of carefully stitching the edges of the hankie to its background. Be still my heart- the vintage style, delicacy, and aged feel- all so appealing. I am interested to know what an iron water bath is. Hope this answer the many questions I received. Mary, this is SO lovely!!!! Just so delicate looking!!!! Love it! Mary....looks fabulous...you put me to shame with all you've done with your eco fabric...mine is still sitting and waiting patiently. The embroidery you've added is lovely beyond words (well, Nancy has those words) and fits so perfectly with the "distressed" vintage hankie. 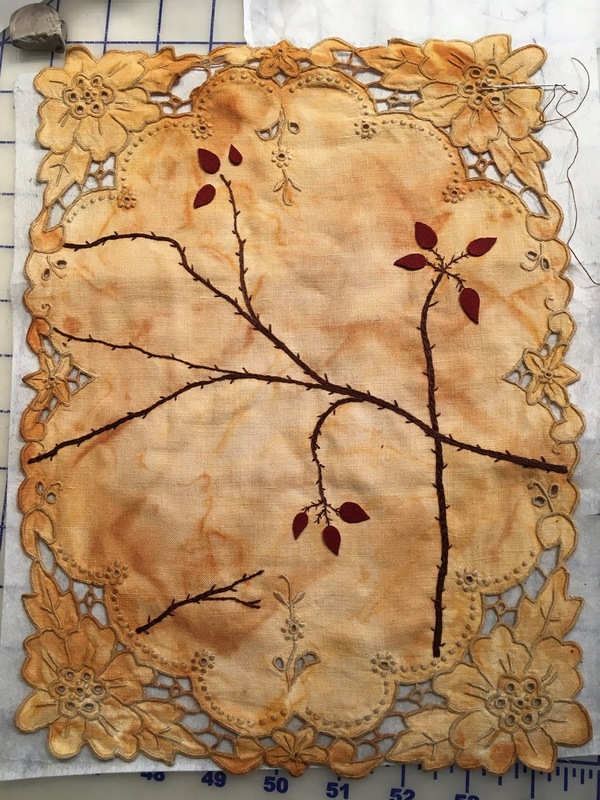 A great reply to the question, "and whatever will I do with my grandmother's handkerchiefs?" 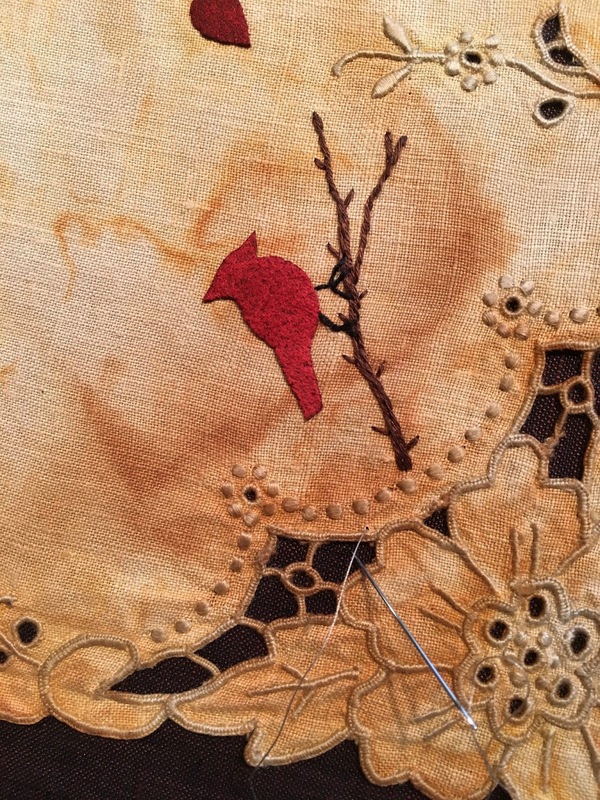 Inspiring to use the many family textiles I have.. . Love the cardinal. 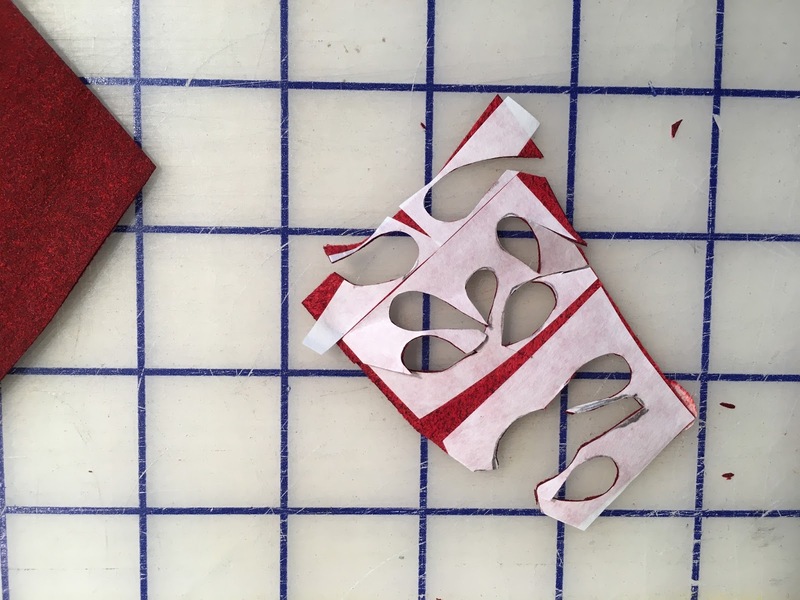 WHAT TO DO WITH THOSE ECO PRINT ITEMS?